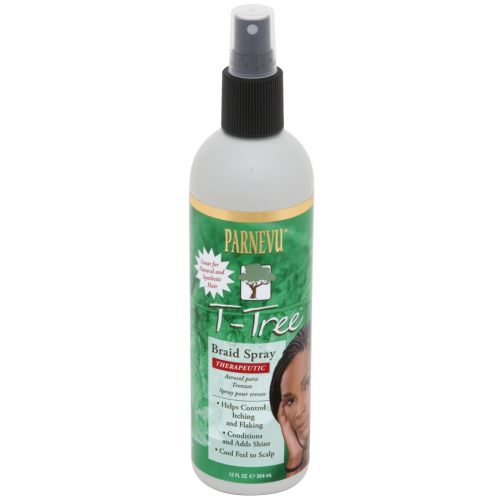 PARNEVU T-Tree Braid Spray, designed for natural and synthetic braid wearers, combines all the therapeutic benefits of our Australian Tea Tree Oil (Melaleuca Alternifolia) in an easy to use spray formula. Our special formula will help control the itching associated with braiding while helping to reduce flaking resulting from a dry scalp. By adding menthol to our formula, your scalp will feel refreshed and cooled with every application. Last, we blended in keratin to condition and keep the hair and scalp moisturized. 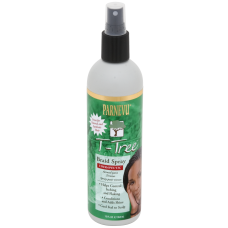 For added protection from breakage around the hair edges, use our PARNEVU T-Tree Break Control. Directions for Use: Spray generously throughout the hair up to 4 times daily, styling as usual. Apply directly to areas sensitive from braiding. INGREDIENTS: Water (Aqua, Eau), Glycerin, Salicylic Acid, Triethanolamine, PEG-12, Dimathicone, Melaleuca Alternifolia (Tea Tree) Leaf Oil, Menthol, PPG-5-Cetheth-10 Phosphate, Hydrolyzed Collagen, Ethoxydiglycol, Polysorbate 20, Quaternium-15, Disodium EDTA, Fragrance (parfum).